Spike Mendelsohn's Prez Obama burger schooled the New York competition. On Friday, chef Spike Mendelsohn of DC's Good Stuff Eatery bested the burger competition at the New York City Food and Wine Festival. His Prez Obama burger — applewood smoked bacon, crumbled blue cheese, red onion marmalade and horseradish mayonnaise on a potato roll — beat out Bobby Flay, Shake Shack, DuMont Burger and Minetta Tavern, among others during the Blue Moon Burger Bash hosted by Rachael Ray. Meanwhile back in the nation's capital, the W Hotel held its grand opening party Thursday night. 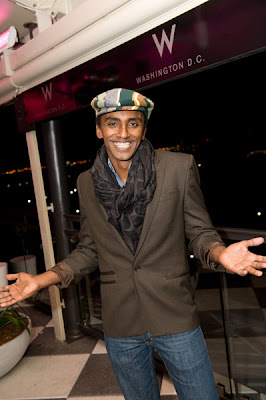 Metrocurean spotted award-winning Aquavit chef Marcus Samuelsson getting his groove on in POV, the hotel's rooftop bar.